Absolutely dreadful film about the making of a terrible movie confuses the hell out of me with the fact it got so much love at the end of last year. The film is a "yahoo aren't we great" recreation of the film THE ROOM which was made by Tommy-Wiseau . The film isconsidered by people who don't know bad films as the worst film ever made is one of the most painful viewing experiences ever. It is so bad that even seeing it riffed by the Rifftrax guys is a tough haul. THE DISASTER ARTIST recreates the making of the film as well as shot for shot sequences from the film. Why any rational human being would want to watch anything that recreates THE ROOM is beyond me. 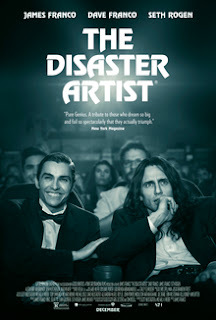 Is it to make fun of the earlier film or to celebrate the stick-to-itness of Wiseau and his friends? I don't know. Why is there a need to be so note perfect...more to the point why does the film have seven or eight minutes of side by side shots of the recreations to the original? We don't need it. What bothers me is that this is 100 minutes with unlikable people who make bad art.